Arcade Fire, Biffy Clyro, Bloc Party, Dinosaur Jr, Panic! At The Disco, The Enemy, Pigeon Detectives, The Twang, The View, We Are Scientists, The Young Knives and Red Hot Chilli Peppers. Phew, should keep you busy downloading for a while! They're mostly not complete sets, but it's great to hear half an hour each of those mighty performances from NIN and Dinosaur Jr again. 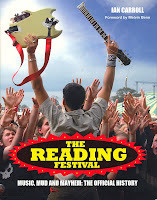 The future of the Reading Festival appears safe after organisers Festival Republic bought 65-acres of the site. This brings Festival Republic's land ownership of the site to 191 acres. The rest belongs to Reading Borough Council. Festival Republic boss Melvin Benn said "This is a very important piece of land and acquiring it was essential to the continuation of the Reading Festival." Let's hope they improve the quality of the facilities now they own the site - and build a bridge across the river to the car park! Okay, this has been out since just before this year's festival, but I've had time to read it, and it's excellent. Packed with anecdotes from artists, festival-goers and the organisers, as well as masses of pics to bring memories flooding back (or show you what you missed through drunkenness or absence). The only thing it's missing is the line-ups from each year. Apart from that, it's a corker! Get it from Amazon here.